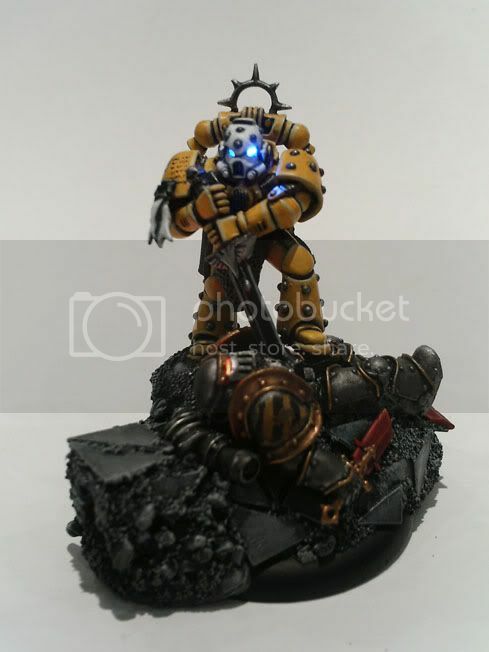 Welcome to the first part of my guide to working with LEDs and toy soliders. Part one will deal with selecting LEDs and designing your circuit. Later parts will discuss inserting them into models. I'm going to assume you know how to use a soldering iron to solder two bits of wire together, but otherwise I'll attempt to start from the basics. 1. How many LEDs? First of all, how many LEDs are you going to use? This will depend on what you're planning with the model. Try not to get carried away until you've had a bit with practise; I'd recommend starting with just one. If you're determined to do more on your first go then please make sure you read the rest of this guide before making your mind up. 2. Where do I get this stuff? There are plenty of places to buy LEDs and other electronic components online. You'll certainly be spoiled for choice on eBay. My personal favourite is Rapid Electronics. You'll need to create an account, but they have great selection, lots of information on your LEDs (which you'll need for part 3 below) and really fast delivery. My personal favourite type of LED for use in 28mm infantry models are these miniature 1.8mm LEDs. They come in a variety of colours and are comparitively quite bright. Make sure you double check the forward voltage though, as it varies for these LEDs depending on colour. Other components, such as batteries, resistors and switches are also available from Rapid Electronics. 3. Designing my circuit. Once you know how many LEDs you want and what their properties are it's time to design your circuit. If all the LEDs in your circuit are identical then they can be connected in parallel. If they are different then I'd recommend connecting them in series. Parallel means that all the anodes are connected to the positive side of the battery and all the cathodes are connected to the cathodes, as opposed to series where the cathode of each LED would be connected to the anode of the next one, one after the other. 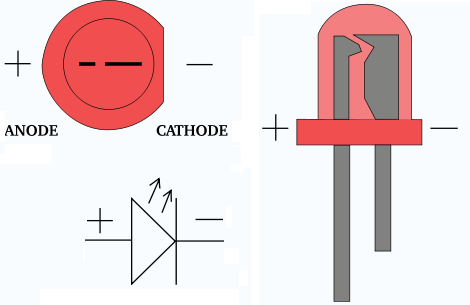 If you don't know about anodes and cathodes, then don't worry I'll explain later. Source Voltage: The total voltage of all the batteries you are using in the model (see section four below). Diode Forward Voltage: Often appreviated as Vf, this is the voltage your LED is designed to operate at. Sometimes Vf (typical) and Vf (max) values will be given. Use the former in this calculation. LEDs are two compact to have this information physically on the product, but the information should be available from the supplier. If using Rapid Electronics, scroll to the bottom of the page. Exceeding the Vf (max) will destroy the LED very rapidly, if not instantly. Diode Forward Current: Normally written as If or If (max), this is the amount of current your LED will draw from the battery. Make sure you enter the value in mA (milliamps). Number of LEDs in your array: This is the number of LEDs you wish to use in your model. If it's just one, then enter '1'. The website will then show you how to wire your circuit! Depending on the numbers you've entered it may recommend inserting resistors into the circuit. If it recommends 1 ohm resistors then these can be left out to save space. The wiring and connections will effectively act as a 1 ohm resistor. If you don't want to have to keep taking batteries in and out then you might want to consider a switch. A single switch can be inserted into your circuit on one side of the battery, either before or after, it doesn't matter. 4. Where's the current coming from? Once you know how many LEDs you're using and how they're going to be arranged, you'll need to consider your power source. Unless the models are part of a diorama next to a power socket and a transformer, then you'll be using batteries. As a general rule each LED will require 3V, so that's one 3V battery or two 1.5V batteries. Although I've put this section fourth, in reality the number of batteries that you can cram into a model is often the limiting factor. If you have designed a parallel circuit then you'll only need voltage equivilent to the requirements of one of you LEDs, as they can 'share' the voltage. If you have designed a series circuit then you'll require voltage equal to the total requirement of all your LEDs. In terms of what batteries to use, you can use AA or AAA batteries in larger models if you have the room, but for 28mm scale single models often a coin cell is a better choice. These have a number of advantages; they're flat and circular so they are easily concealed in a standard base. Also, they are available in 3V iterations, rather that 1.5V, so take up even less space. I particularly recommend CR2025 batteries. These are intended for use as clock batteries in computers so last a long time. Also, very compact batteries holders are available. If you conceal the holder in the base of your model facing downwards, then the battery will be very easy to change or remove when not in use. 5. Soldering LEDs. Finally, here's a couple of tips for working with LEDs. LEDs are diodes, so they care about polarity, i.e. which way they are connected to the battery. The longer leg is the anode (positive) side, and the shorter leg is the cathode (negative) side. Many LEDs also have a flat edge on their case above the cathode to further help with identification. Here's a helpful visual summary. LEDs can be damaged by excessive heat when soldering. If your soldering iron has a temperature setting then I'd recommend not going above 300 degrees C, unless you have specific information from the manufacturer that they can widthstand a higher temperature. A lot of LEDs have little notches near the top of their legs. Try not to cut or solder above these if you can help it, as you'll increase the risk of damaging the LED. Most LEDs are highly directional, and will be brighter when viewed from certain angles than from others. Make sure they're pointing the right way when they go into the model. Don't be afraid to cut or file down the case of the LED. It's just plastic and has no effect on the operation of the LED itself. Just make sure you don't disturb the p-n junction (the silver bit shown in the diagram linked to under the first bullet point).